A sawmill or lumber mill is a facility where logs are cut into lumber. 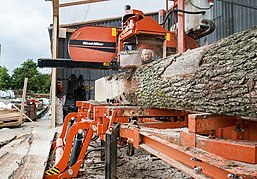 Modern saw mills use a motorized saw to cut logs lengthwise to make long pieces, and crosswise to length depending on standard or custom sizes ( dimensional lumber). 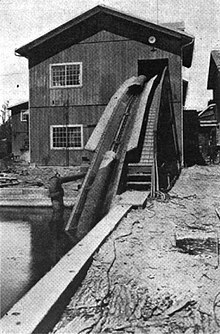 The "portable" saw mill is iconic and of simple operation—the logs lay flat on a steel bed and the motorized saw cuts the log horizontally along the length of the bed, by the operator manually pushing the saw. 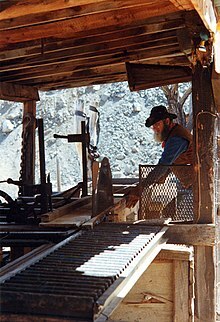 The most basic kind of saw mill consists of a chainsaw and a customized jig ("Alaskan saw mill"), with similar horizontal operation. 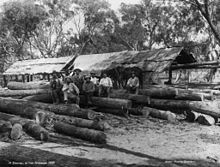 In the United States, the sawmill was introduced soon after the colonisation of Virginia by recruiting skilled men from Hamburg. 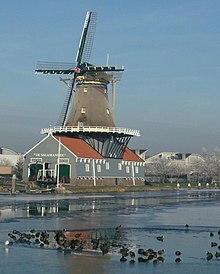 Later the metal parts were obtained from the Netherlands, :94-95 where the technology was far ahead of that in England, where the sawmill remained largely unknown until the late 18th century. The arrival of a sawmill was a large and stimulative step in the growth of a frontier community. A trend is the small portable sawmill for personal or even professional use. Many different models have emerged with different designs and functions. They are especially suitable for producing limited volumes of boards, or specialty milling such as oversized timber. Portable sawmills have gained popularity for the convenience of bringing the sawmill to the logs and milling lumber in remote locations. Some remote communities that have experienced natural disasters have used portable sawmills to rebuild their communities out of the fallen trees. ^ a b Peterson, Charles E. (1973). "Sawdust Trail: Annals of Sawmilling and the Lumber Trade from Virginia to Hawaii via Maine, Barbados, Sault Ste. Marie, Manchac and Seattle to the Year 1860". Bulletin of the Association for Preservation Technology. 5 (2): 84–153. doi: 10.2307/1493399. JSTOR 1493399.